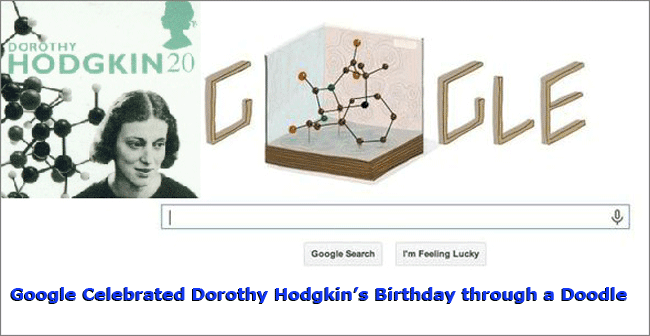 One of the greatest women in history’s birthday was celebrated by Google and she is a British chemist named Dorothy Hodgkin. If you are going to visit Google’s homepage you will see the evidence. The thing is a Doodle was created and placed on the homepage of the most famous search engine in the world. Dorothy Hodgkin was born on May 12, 1910 and if you are familiar with the protein crystallography, she was credited for that. In fact, Hodgkin received the Nobel Prize award in Chemistry because of her discovery in Vitamin B12’s molecular structure. During that time she was the third woman who received such recognition. Hodgkin studied in the University of Oxford where she learned a lot of things there. Her passion led her to discovery of a lot of things and one of them is the advanced technique on X-ray crystallography. This technique has led her to work out penicillin’s structure and this was in the year 1946. When you visit the homepage of Google, you will see a figure there show in the middle and that is the structure that is mentioned here. The image represent’s Hodgkin’s great contribution to chemistry and this is displayed in the Science Museum which is situated in London. Looking at Google’s homepage is always surprising and this is something good about Google because they give value to the hardship of great people of the past like Dorothy Hodgkin. Truly, this is surprising and the fact remains that sometimes the heroism of people like Hodgkin is buried in the archive of the past. With Goolge’s commemoration of her birthday, it is like a reminder to become excellent in this field. This should serve as an inspiration to those who would like to achieve something in the future like Dorothy Hodgkin.